In Carroll's provocative reading of the deep past, the Bible's brutality responded to the violence that threatened Jerusalem from the start. Centuries later, the mounting European fixation on a heavenly Jerusalem sparked both anti-Semitism and racist colonial contempt. The holy wars of the Knights Templar burned apocalyptic mayhem into the Western mind. Carroll's brilliant and original leap is to show how, as Christopher Columbus carried his own Jerusalem centric worldview to the West, America too was powerfully shaped by the dream of the City on a Hill - from Governor Winthrop to Abraham Lincoln to Woodrow Wilson to Ronald Reagan. The nuclear brinksmanship of the 1973 Yom Kippur War helps prove his point: religion and violence fuel each other, with Jerusalem the ground zero of the heat. 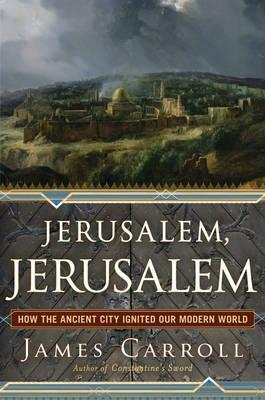 James Carroll's urgent, masterly "Jerusalem, Jerusalem" uncovers the ways in which the ancient city became a transcendent fantasy that ignites religious fervor unlike anywhere else on earth. That fervor animates American history as much as it does the Middle East, in the present as deeply as in the past. In Carroll's provocative reading of the deep past, the Bible came into being as an act of resistance to the violence that threatened Jerusalem from the start. Centuries later, holy wars burned apocalyptic Jerusalem into the Western mind, sparking expressly religious conflict among Jews, Christians, and Muslims. The heat stretched from Richard the Lionheart to Field Marshal Edmund Allenby, whose World War I conquest of the city relit the fuse for a war that still rages. Carroll's brilliant leap is to show how, as Christopher Columbus was dispatched from the Crusades-obsessed Knights Templar's last outpost in Iberia, the New World too was powerfully shaped by the millennial obsessions of the City on a Hill -- from Governor Winthrop to Abraham Lincoln to Woodrow Wilson to Ronald Reagan. Heavenly Jerusalem defines the American imagination -- and always, the earthly city smolders. Jerusalem fever, inextricably tied to Christian fervor, is the deadly -- unnamed -- third party to the Israeli-Palestinian wars. Understanding Jerusalem fever is the key that unlocks world history, and the diagnosis that gives us our best chance to reimagine peace. "What a remarkable book! I was blown away by the breadth and depth of it. Another hugely important book from James Carroll, right there with "Constantine's Sword."" -- Reza Aslan, author of "No god but God" "A gripping account of how Jerusalem has fired the spiritual imagination of the West from Biblical times to the present -- and a deeply personal meditation on the religious impulse itself, and its dark double, sacred violence. More than a rebuke to jihadists and religious extremists, this book challenges secularists who believe that, for modern Western societies, wars of religion are a thing of the past." -- Michael Sandel, author of "Justice: What's the Right Thing To Do?" "I dare you to read this book and see Jerusalem, or yourself, the same way." -- Bernard Avishai, author of "The Hebrew Republic" "James Carroll's "Jerusalem, Jerusalem "should be required reading for all: it is a lucid, calm, deeply compelling history of the literal and symbolic significance of that city, at the heart and origins of Judaism, Christianity and Islam. Marshaling an extraordinary range of sources, Carroll illuminates the interwoven violence and redemption that define Jerusalem in the world entire, up to this day." -- Claire Messud, author of "The Emperor's Children"
His critically admired books include Practicing Catholic, the National Book Award-winning An American Requiem, House of War, which won the first PEN/Galbraith Award, and the New York Times bestseller Constantine's Sword, now an acclaimed documentary.